Thermawood Retro-fit Double Glazing remains substantially warmer than single glazing. Therefore, condensation is dramatically reduced. Condensation forms when warm air containing moisture meets a cold surface cold enough for dew point to be reached. Double Glazing enables a thermal barrier to form between your home interior and the cold outdoors. Double Glazing can reduce your energy consumption, saving money and assisting in saving energy contributing to a healthier nation. Many older homes use a much greater amount of energy to both heat and cool due to poor insulation qualities. Double Glazing can substantially reduce the overall costs by retaining heat during winter and cooler during summer, making your home much more energy efficient and creating a much healthier environment for your family. The IGU units can use any type of glass however, for maximum effect we recommend using Low E (low Emissivity) Glass and Argon gas in the IGU. This will dramatically improve warmth and reduce energy costs by significant amounts when compared to a standard glass unit. The Low E glass has a high performance transparent coating that drastically reduces heat transfer inside and out. Teamed with high performing insulation, Thermawood can create an optimal, well ventilated environment that has a high level of Indoor Air Quality (IAQ). The World Health Organisation recommends that the optimal indoor temperature for good health should be between 18ºC and 21ºC. A desirable IAQ will ensure that is will not cause or aggravate illness in building occupants while also securing a suitable level of thermo-comfort. Your home is more desirable when it comes time to sell your property as the original character look is still maintained and thus the architectural aesthetics of your home are not compromised. How Much To Retrofit Double Glazing? The cost of your converted existing wooden windows will vary depending on the glass that you choose to use as well as the dimensions of your windows or glass doors. Since there is no need to rip out those beautiful timber window frames with Thermawood’s patented retrofitting process converting your existing windows costs much less than traditional double glazing, with a similar price level to secondary glazing. With Thermawood’s retrofit design, you’ll pay about one-third of the cost of new double glazed windows. You won’t have to replace your existing windows, or rip out your current timber frame, which will mess with the cladding, internal linings, and can possibly destroy the aesthetic of your home, You will get all of the energy efficiency and home value advantages of new double glazed windows as well as the draft and acoustic seals without the high price! Many property owners today are using double glazing to cut energy costs while also increasing the security, comfort, and air quality of their home. And for urban dwellers, to drastically reduce noise levels, creating an indoor space that is the peaceful haven it should be. The problem is, due to the complex work and extra materials required, double glazing is not budget-friendly. Having to replace your existing windows can also sacrifice the original aesthetic of the home, leaving many homeowners to wonder if the investment is worth it, despite the energy benefits. On the other hand, alternatives to new double glazed windows, such as secondary glazing – which costs about the same as Thermawood retrofit double glazing – are less expensive than conventional double glazing but they come with their own set of problems. 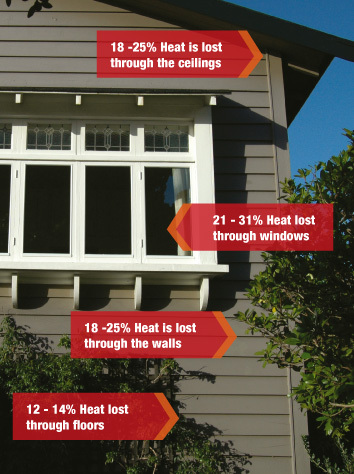 Secondary glazing is less than half as effective at protecting a home from heat loss and solar gain. It also does not properly address issues such as glare, condensation, and home safety. Secondary glazed windows are also difficult to take care of, as you have to clean four glass surfaces, two of which are difficult to reach. Thermawood’s retrofit double glazing system offers property owners a cost-effective solution. It doesn’t just provide the ultimate in performance it also allows you to maintain the existing character of your home. Heat lost through the selling. Heat lost through the walls.